So do one hundred million other Americans. On winter mornings, spouses attempt to drag us out of bed, but only coffee’s rich aroma can coax us from warm covers. However, we demand — er, appreciate — our beverage of choice in diverse ways. 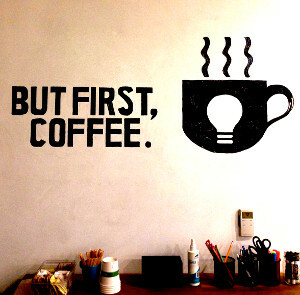 Take, for example, the Coffee Connoisseurs. Even if shivering on an Arctic island, alone with a can of cheap coffee (and opener), they would suffer until a Starbucks floated their way. Connoisseurs own roasters and gravitate toward flavors like jalapeño coconut. They may not remember their kids’ birth dates, but they know their coffee’s pedigree. At the spectrum’s other end: the Coffee Classicists. Most purchase their parents’ brand, though some have been seduced by bags of beans given by pitying offspring. A large gimme-it-black contingent rules within this group. Those who take cream and sugar want exactly that. No organic sassafras sweetener. No fat-free peppercorn creamer. And they want coffee served in favorite mugs or china cups and saucers. Both groups reject decaffeinated coffee as counterfeit. Decaf advocates, however, cite better sleep cycles. Plus, their work rage manifests itself only in yelling at computers, rather than throwing them. Consumers often claim they can distinguish between decaf and high-octane by mere taste. My former boss spotted the difference before he tasted it (his wife had replaced half his favorite brand with decaf). Me? I just love coffee. With or without caffeine, plain or flavored (though I draw the line at jalapeño coconut), black or sugared and cream-ated, in mugs, china cups and saucers. I usually brew my own, but occasionally buy it at Quickie Mart, Mickey D’s, or Starbucks, if I have a gift card. You’ll find me at any friendly coffee corner where a fellow drinker and I can shoot the breeze, sip and savor. Are you a Coffee Connoisseur or Classicist? Or perhaps you take coffee with your cream and sugar? This entry was posted in Coffee Corner and tagged Beverages, Caffeine, Coffee, Decaf, Humor, Rachael O. Phillips on January 20, 2016 by rachael.